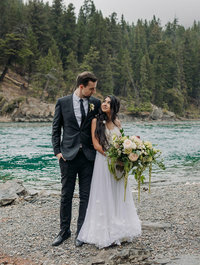 Lisa & Cameron chose to have their Jasper winter elopement on April Fool’s Day… and we weren’t really sure if it was going to be winter or not since April can be a tricky time of year. We were set to have their ceremony on the top of a mountain, but just seconds after we boarded the gondola at the Jasper SkyTram, a storm blew in. Like a real snow storm where the snow and wind was so intense that it was snowing inside the enclosed gondola and the normally 7-minute ride took over 20 minutes because we had to go so slow because of the high winds. Once we made it to the top it was a white out. No mountains to be seen in any direction. So the plan was to do the ceremony back at the bottom now… but with the winds, we were stuck on top of the mountain for an hour and a half before it was safe to operate the gondolas again to take us all back down. Quite the way to start the day! It all turned out well though. We picked a nice spot overlooking the Athabasca River for the ceremony and then I had Lisa & Cameron jump in with me (since they blew a tire driving back down the mountain… seriously, April Fool’s Day had it in for us) and we took off to Medicine Lake where it was a beautiful winter wonderland. We stayed there for awhile and another bone chilling storm blew in and we decided to head back down the mountain. On the road though, we were greeted with these huge, fluffy beautiful snowflakes so we jumped out and started taking photos for the few minutes the snow lasted. That snow truly was magical! Onward we went, near the 5th bridge to take more photos on the water before we wrapped for the night. 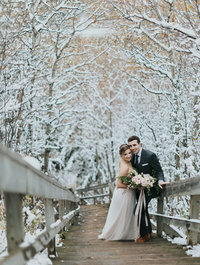 Here are some of my favourite photos from Lisa & Cameron’s Jasper winter elopement! Are you planning to get married? 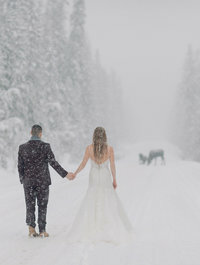 Are you having a Jasper winter elopement? ENV Photography would love to be the one to capture your wedding or elopement in Jasper! Please get in touch for more information on weddings & elopements in Canmore, Banff, Emerald Lake, Lake Louise and other destinations. 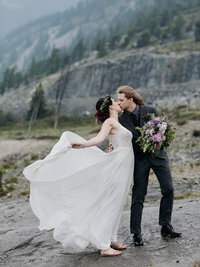 If you aren’t in the market for a Jasper Elopement photographer or a Jasper Wedding Photographer, ENV Photography also photographs maternity, kids & families!